Argon Gas Feed Hose Assemblies enable non-contaminated feeding of argon gas into welding zone. Units are available off the shelf in lengths of 30 m, 25 m, 20 m, 15 m, 10 m and 5 m. Hoses can be operated in -30ºC-80ºC temperature range and feature safety factor of three times the working pressure (300 psi). Units are offered with argon regulator that connects to range of inflatable tube and pipe weld purging systems. Advancing forward in weld purging technology, Huntingdon Fusion Techniques HFT® now manufacture tailor made Argon Gas Feed Hose assemblies with leak tight fittings. The natural rubber feed hose comes complete with an argon regulator, which directly connects to any range of Inflatable Tube and Pipe Weld Purging Systems at one end and to the gas source at the other. 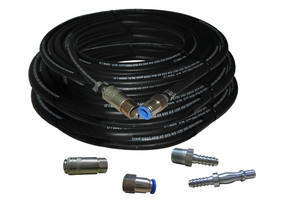 These hose assemblies can also be used for transporting other gases where a guaranteed leak tight delivery is required. A selection of leak tight adaptors is provided for attaching the argon gas regulator whilst the pre-fitted other end joins up with all HFT® Argweld® Weld Purging Systems. All of these high quality fittings will eliminate welding connection difficulties that welders might experience on site. The Argon Gas Feed Hoses can also be supplied to all other TIG / GTAW welders with their own special fitting as required. The hoses are available off the shelf in a standard range of lengths, 30 m, 25 m, 20 m, 15 m, 10 m and 5 m.
Conforming to British Standard BS EWN 599 Quality Standard, the Argon Gas Feed Hoses each have a temperature range from -30º up to 80ºC and a safety factor of three times working pressure 20 bar (300 psi). HFT® advises welders to only use top quality hose assemblies to feed argon gas for top quality welds! Huntingdon Fusion Techniques HFT® has a worldwide Exclusive Distributor network. For your nearest Exclusive Distributor, please visit: www.huntingdonfusion.com. Water Hose features heavy-duty construction. Flexible Watering Wand reaches otherwise inaccessible areas. Suction Kit cleans sediment from hot water heaters.